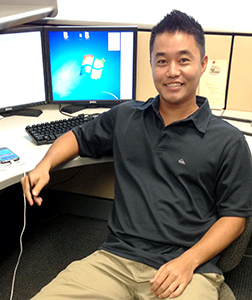 Eric Yamasaki is a senior at UH West Oahu majoring in information technology. He previously was enlisted in the United States Air Force in 2007 and deployed to Iraq in 2009. After the successful completion of his first term, he was honorably discharged. In 2011, he joined the Air Force Reserves and is still currently a member. After a successful endeavor in the military, Eric decided that a bachelor’s degree was the next challenge to accomplish. Currently, he has a 3.81 GPA and is projected to graduate in the fall of 2014. His future goals are to have a fulfilling career and to pursue a master’s degree. Project Abstract: The blood module of the Theater Medical Data Store (TMDS) is currently the only way that military personnel can electronically track, receive, and analyze the current inventory of blood packets at any medical treatment facility (MTF). TMDS has persistent issues with its limited capacity for Internet connectivity, its mobility, and its extensive interface. We have chosen to construct an Android application (“app”) called Blood Packet Scanner to complement TMDS and resolve these obstacles. Specifically, the Android operating system (OS) was selected because it is an open OS, unlike Apple’s iPhone operating system (iOS), which is closed. Utilizing Android’s open OS allows for greater flexibility and control of its architecture and features, allowing it to be custom-tailored to specific environments. Both TMDS and Blood Packet Scanner have scanning capabilities, but Blood Packet Scanner employs its built-in camera as a scanner, creating an all-in-one solution. Data storage on the mobile device is handled by an integrated database on the phone itself, without the need for network connectivity. Blood Packet Scanner’s ability to be integrated with 3G, 4G, global positioning system (GPS), and Wi-Fi technologies creates multiple solutions for mobile connectivity and network redundancy. Implementing Blood Packet Scanner specifically on mobile phones would be a benefit in-theater because of phones’ inherently small size, making transportation effortless. The design of our user interface (UI) was influenced by mobile phones’ small screen size — a simplistic approach was implemented, applying only the core essentials, which also contributed to ease-of-use. Further development of the Blood Packet Scanner app would attempt to integrate more of TMDS’s capabilities, while still maintaining mobility, connectivity, and ease-of-use.